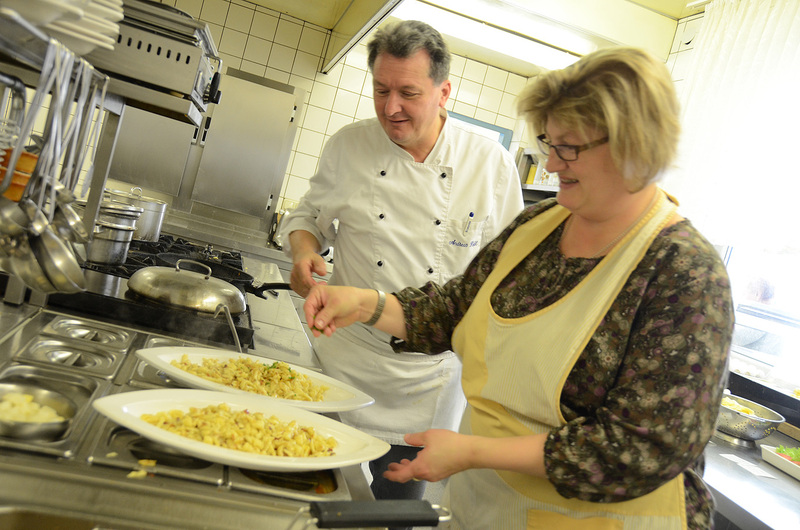 Andreas Hoessl and his wife, Andrea, put the finishing touches on two plates of kaesespaetzle (a German version of macaroni and cheese) at their restaurant “Zum Stich’n” in Grafenwoehr. Photo by Molly Hayden, USAG Bavaria Public Affairs. GRAFENWOEHR, Germany — Dining in Deutschland can be a rich and cultural experience and feasting on traditional Bavarian cuisine while sampling the local brew can enhance that experience. Eating like a local is one thing, but learning how to dine like a local can take some getting used to. Learn a few tricks, however, and you’ll have the recipe for a new culinary outlook. Lingering in the doorway of a restaurant waiting for someone to direct you toward a table is common in America, but try that in Germany, and you could be waiting a very long time. Diners are expected to find their own tables, so sit wherever you please, unless there is card on the table reading “Reserviert” or “Stammtisch” indicating the table is reserved. During peak dining hours, it is not unusual for patrons to join other tables. While it may seem unnerving for the average American, it is actually quite practical for Germans. If there are enough seats at a partially filled table for your party, simply point and ask “frei?” asking if the chair is free. If the patron nods yes or replies with a “ja,” have a seat. Likewise, customers may ask to cozy up to your dinner party. Let them. Generally the two parties politely ignore each other, but you could end up making a friend and learning a thing or two about local dining. Four-legged friends are also welcome at most restaurants so don’t be surprised if you see a wagging tail sneaking out from underneath a table. Complimentary water does not magically appear on your table at a restaurant and this may come as a shock to most Americans. Serving tap water is not common in German restaurants, however, so they may or may not oblige. Additionally, no free refills are offered at dining establishments, so be prepared to pay for your second glass. If wine or beer is served (and it usually is), wait for everyone to receive drinks then propose a toast to start drinking. Most of the time a simple “Prost!” (“Cheers!”) or “Zum Wohl!” (“To your health!”) will suffice. It is important to look each person in the eye with whom you are clinking glasses. When it comes to food, however, generally you eat as your dish arrives, and you’ll notice all food is not served simultaneously. As the food is placed in front of you, politely ask your table acquaintances if it is OK to begin and once you hear “guten appetit,” dig in. Germans and other Europeans rarely eat with their hands – even pizza is eaten with a knife and fork. However, if you are eating informally, it’s OK to eat some foods with your hands. German cuisine is far more than the stereotypical sausages, sauerkraut and beer. It is comforting and flavorful, and heavy on meat and potatoes dishes. Many seasonal dishes, including white asparagus (spargel) in the fall and local mushrooms (pfifferlinge) in the summer, are offered on the specials. German restaurants usually serve generous portions. Despite this, patrons often clean their plate as it is considered polite. Your server may ask if there was a problem with the meal if too much food is left on the plate. Once you assure them that “es hat geschmeckt” (it was delicious), ask “Kann ich das bitte mitnehmen?” (Can I please take this with me?). The term “doggy bag” doesn’t translate well and the sever may think you feel the food is only fit for a dog, so avoid using it. But being the four-legged lovers that they are, if your meal comes with a bone, they will be happy to wrap it up for your furry companion. Look for “Kinderteller” on the menu for children’s portions. Not every restaurant has a children’s menu, so feel free to order a few side dishes instead. Each establishment will most likely accommodate for your little one. The bill will not automatically come to your table. Placing the bill on the table automatically, to Germans, indicates they wish for you to leave. As this is considered rude, your server will instead continue to ask if there is anything else you would like and welcome you to stay for as long as you like. Once you are finished dining, tell the server you’d like to pay by saying “zahlen, bitte.” After you pay, you are expected to leave, so only pay when you’re ready to walk out of the door. Tips are not a must in Germany, but are always welcomed. It’s a very different system than the U.S., however. As a general rule, round up to an even number or give around 10 percent of the total cost of your bill. For example, if dining in a German restaurant and the bill comes to 32.80 euros, giving the server 35 euros is more than acceptable. If you hand them a total of 40 euros, simply say the amount you wish to round up “35 euros,” and you will receive the correct amount of change. If you wish to pay the tip separately, hand it to your waiter. It is not advised to leave it on the table as it might disappear before making it to the server. If you want to give the whole change of your bill as a tip, hand the waiter the euro notes and coins and say “Das stimmt so” or just “Stimmt so.” The server then will not give any change back but accept it as the tip. Tips are not a must in Germany as they are in the U.S. Most restaurants will have a note on their menu like “Unsere Preise enthalten Mehrwertsteuer und Trinkgeld” which means that their prices include Value Added Tax and tips. Despite this fact, most people do tip. And most servers appreciate it as much as you’ll appreciate the Bavarian hospitality when dining out.